Location: Site lost under A561 Garston Way. The station was sited west of Church Road. Present state: Demolished the site is now occupied by a bypass and a freightliner depot. 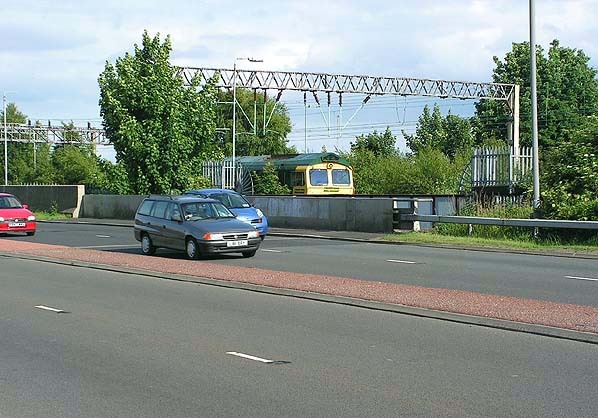 Notes: Church Road Garston Station was opened by the LNWR in 1881 as the penultimate stop on what had become its Liverpool Lime Street to Garston Dock Line. The line started life as the western extension of the St. Helens and Runcorn Gap Railway from Widnes to Garston which opened on 1.71852. Church Road Garston was closed between 5.4.1917 and 5.5.1919 as a wartime economy measure. The station finally closed in 1939 probably because it was so close to Garston Dock Station. Passenger services continued to pass through the site of the station on the local service calling all stations from Garston Dock to Liverpool Lime Street until 16.6.1947. For many years after closure the line was used as an important freight artery between Cressington Junction and points to the east but it closed in the 1970's and today the site is occupied by a road and a freightliner depot.